Craving a bite of dessert? Looking for a sweet way to thank a business client? Jarosch Bakery's wide selection of cupcakes and cake shots includes fabulous favorites and singular seasonal treats. And if you really want to add a personal touch, custom cupcakes are available so stop by or call us today for more information. 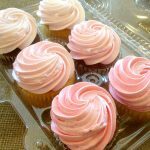 Our daily assortment of fresh Jarosch cupcakes includes Basic, Seasonal Pre-packs, and Gourmet. Choose from buttery Yellow or tender Devil’s Food cupcakes iced with lush white buttercream or rich fudge and garnished with seasonal sprinkles. These include three Yellow and three Devil’s Food cupcakes iced with colorfully festive buttercream and garnished with decorations, both depending on the season. Available every day, each month we change the six flavors to reflect seasonal tastes— in summertime we’ll offer the S’more Cupcake while the Pumpkin Cupcake will be available in the fall. Check out our Monthly Specials to find out the current selection of Gourmet Cupcakes. Whether you want cupcakes to reflect your child’s birthday theme or you need elegant treats with a bridal flair, our friendly Jarosch Bakery staff will help you design custom cupcakes perfect for any event. Pricing depends on design and all cupcake customizations must be done in either fondant or buttercream. Cupcake stands are available to rent so be sure to ask about the best way to display your custom cupcakes. 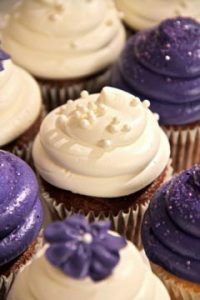 All custom cupcakes are iced in buttercream, decorated with buttercream or fondant, and available year round in Yellow, Devil's Food, and Red Velvet cake. Other cupcake flavors may be available depending on the season. Please allow at least 1 week for custom buttercream orders and 2 weeks for fondant decorations. If you have a time constraint give us a call and we'll discuss options. Our Jarosch Bakery team developed these delightful desserts perfect for hosts wanting to offer treats in a variety of flavors. Cake Shots consist of cake layered with different fillings inside of a small plastic cup. These shots contain no alcohol unless indicated and each shot comes ready-to-eat with a small plastic spoon. Simple set up and easy clean up! Six flavors are available in store every day and are changed each month to reflect the season. Try flavor combinations like Birthday Cake, Hot Cocoa, Bananas Foster, and Salted Caramel. Customized flavors and decorations are limited but available. To see this month’s Cake Shot selection, check out our Monthly Specials.